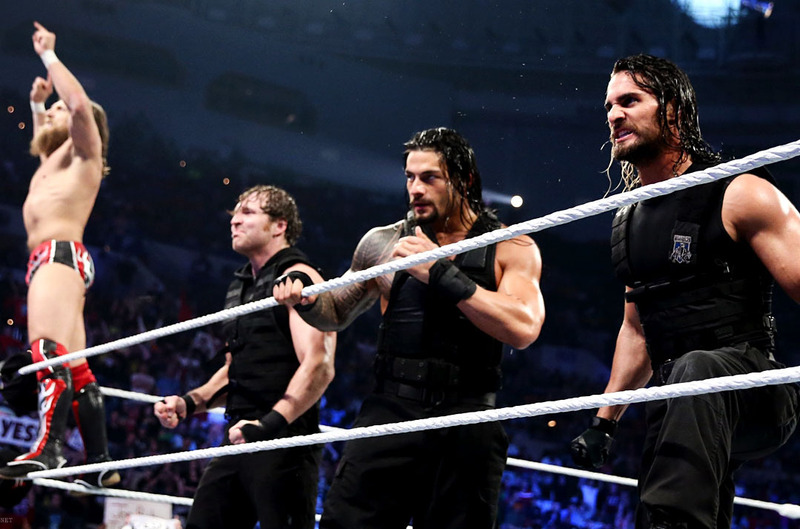 Smackdown has been very entertainingly the past few weeks, and this week's was no different. The show saw The Shield and Daniel Bryan send out a huge statement, and The Wyatt Family send another eerie message to John Cena. John Cena kicked off Smackdown, and the Cenation leader started talking about recent events that have happened in the WWE as of late. He mentioned the young NXT rookie, Paige defeating AJ Lee to win the Divas Championship, the end of The Undertaker's legendary WrestleMania streak, and Daniel Bryan overcoming the odds to knock off not just Triple H, but both Randy Orton and Batista as well to become the WWE World Heavyweight Champion. Cena was interrupted by Bray Wyatt and The Wyatt Family. As they were in their usual dark, creepy location somewhere backstage, Bray Wyatt cut another bonechilling promo, and by what he was saying, it sounds like we could see Bray Wyatt vs. John Cena II at Extreme Rules. In a match that lasted around 5-10 minutes, Cesaro and Big Show went back-and-fourth, with both guys showing big feats of strength. In the end, Jack Swagger interrupted the match, and attacked Cesaro, until Big Show got rid of "The Real American". To send a huge statement, Cesaro delivered a huge Neutralizer on the near 500 pound giant, Big Show. After what happened here, we may well see a match between two former friends, Jack Swagger and Cesaro at WWE's upcoming pay-per-view, Extreme Rules. FINAL RESULT: Cesaro def. Big Show via. Disqualification. After returning to in-ring action last Monday on Raw, Bad News Barrett was hungry for another victory, and Kofi Kingston was his next target. In a fairly decent bout that lasted about 10 minutes, Barrett got the win over Kingston with a sickening Bull-hammer Elbow, knocking Kofi Kingston's lights out. It's great to see Barrett back in the ring, and collecting victories while he's at it. Things are definitely looking up for the Manchester born Superstar. FINAL RESULT: Bad News Barrett def. Kofi Kingston via. Pinfall. Ryback and Curtis Axel had been on quite good form as of late, and the former Paul Heyman Guys looked to continue that form bighead into this match against Los Matadores. The match wasn't really top quality, as it was filler. Ryback & Axel managed to grab the win, and continue their decent form. FINAL RESULT: Ryback & Curtis Axel def. Los Matadores via. Pinfall. After losing to RVD on Raw, Damien Sandow hoped to get revenge on Van Dam by beating him here. Sadly fro Damien Sandow, that didn't happen. The match was actually good, with some high-paced, back-and-fourth action. In the end, being the dare-devil he is, RVD launched himself from the top rope, hitting his signature move "Five Star Frog Splash" on Damien Sandow to pick up the win. I like RVD, but it's very sad to see Sandow lose, yet again. FINAL RESULT: Rob Van Dam def. Damien Sandow via. Pinfall. I really enjoyed this segment. Seeing Hulk Hogan, the man who has done it all, with a man who has a VERY bright future ahead of him, Daniel Bryan was amazing. One generation to another. Hogan started talking about WrestleMania 30, and how great a spectacle it was, and he then brought out the WWE World Heavyweight Champion, Daniel Bryan. The leader of the "Yes Movement" said that Hogan was his childhood hero, and inspiration to succeed. He also said he has always be a "Hulkamaniac". Hogan and Bryan ended the segment by posing to The Hulkster theme song. In a match that lasted no longer than 5 minutes, Fandango got the win over Santino Marella with a roll-up pin, thanks to Layla causing a distraction to Santino. The match wasn't really anything special. But, I'm looking forward to see what happens next for Fandango and Layla. FINAL RESULT: Fandango def. Santino Marella via. Pinfall. This match was probably the best part of the night. As you'd expect, Bryan & The Usos brought the high-paced, high-flying action to the match, while Orton, Batista, and Kane brought more of a type of power, and the general wrestling. The match ended in a double-countout, with both teams brawling. Orton and Batista laid out The Usos, and just as Kane was about to do the same, The Shield came out, and started attacking Kane. Orton and Batista ran from The Hounds Of Justice, and left Kane to fend for himself. It didn't end well for the Director Of Operations, and Daniel Bryan knocked his lights out with a running knee. The Shield and Daniel Bryan stood tall in the ring, looking up at Orton and Batista who were on the ramp. FINAL RESULT: Daniel Bryan, The Usos, and Batista, Randy Orton and Kane wrestled to a double-countout. Do you give Smackdown a thumbs up, or thumbs down? Be sure to share you thoughts in the comment box below!